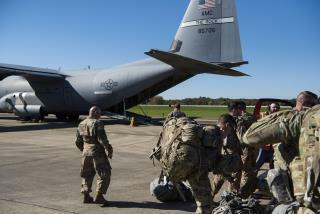 (Newser) – The Trump administration asked, and the Pentagon said no—to using troops on the southern border for law-enforcement purposes, CNN reports. Two defense officials say the Department of Homeland Security wanted US troops to provide "crowd and traffic control" and protect Customs and Border Protection officers from the so-called "caravan" of Central American migrants heading for the US border. But on Oct. 26, the Pentagon denied that request, while agreeing to provide engineers, medical personnel, and air and logistics support. Why the refusal? Because the Department of Defense apparently argued that active-duty troops don't have the authority. The military have already told trump they won't kill women and children overseas as he and his racist rabble want. Now they have told him: "US generals have refused a request from Donald Trump to build migrant detention centres as thousands head to the Mexican border." ....of course trump lied and said they were building them. Now he is being told NO again on enforcing domestic law. Do any of you trumpanzees seriously think the military would say NO to the president if they were not being asked to do seriously bad things? Notice how far does your trump worship is taking you from America and the American people. Obviously our Law enforcement agencies, the Pentagon and 75% of our Congress have NO will what-so-ever to enforce our borders, but will instead criminally prosecute anyone who will or try to. Wake up Americans !!! The True Citizen Patriots of America, could and would put an end to this B.S. at our Borders if only our anti-Sovereign American Nation Congress and Law enforcement agencies would get out of the way !! !